The Afro's are great ESC's...but they aren't a great budget choice. I've had decent luck ordering from banggood...but they use really slow shipping to the US. One of the slowest places I've ordered from in Hong Kong in fact. So if you're not in a hurry those are probably a decent budget choice. But for the same price RTFQ has his version of the HK F20's pre-flashed with SimonK and since you're in FLA as well if he gets them out the door quick they should be on your doorstep in just a day or two. (BTW - you mentioned you have electronics experience...I saw on the thread at RCGroups about his kk2.0 board that he's looking for people who can solder...if you want to make some extra cash on the side might be worth getting in touch with him.) Of course - that's also assuming you're ok with ordering from him given his questionable ethics with cloning and not directly contributing to the original designers even though it's not required. At $11 each I'm overjoyed with my Angels. I've heard a lot of great things about the suppos but at $15 each I just can't swing them for a quad. Even with 2 on hand you're spending almost as much as a new set of 4 Angels. There's also the RTFQ "house" motors he says are made by Suppo at just $10.50 each...they're a bit lower KV but higher power than the Suppo's you've already got. And being lower KV they can swing a bit bigger of a prop and have the potential of being a bit more efficient: http://witespyquad.gostorego.com/motors/witespy-red-special-motor-1000kv.html They're also a "shaftless" design which I really like for quads as it seems to minimize damage in crashes considerably. They aren't "great" props. But for the price they're outstanding and I've tried props that cost considerably more and weren't nearly as nice. I don't have a great balancer (just the HK "Finger balancer" which I rig between some strong magnets to make my own magnetic balancer) but with those props about 90% of them are balanced out of the bag on my cheap balancer. Maybe once I pony up for a good balancer I'll find that my balancer has been misleading me and they're a lot further out of balance than I think they are....but they sure seem to run smooth for me and hold up remarkably well. In fact I knock motors off by breaking zip ties far more often than I break props now. I'm not checking much RTFQ site, since for people like me in EU, it makes not much sense, but for people in US, yes, it is a good place to order .. price are very competitive, and it is local in US. Your suggested motor is looking fine, it has some plus and some minus compared to the DST-1200 ... in my experience DST-1200 and the 5$ Donkey motor .. are good and reliable motors ... I had other cheap motors, and these just last 10 flights before the ball bearing got destroyed (so badly that I can't even take it out from the shaft) .. my DST-1200 are as good as on day one. Donkey have no ball bearing, so, they are a bit less efficient, but they are more durable. Anyhow .. the 10$ motor from RTFQ is looking a good option, a bit expensive for my taste, but it is ok.
About ESC ... I see that RTFQ has a huge selection of different ESC with SimonK ... for a good price too. I agree. The motor and esc's are taking a huge chunk out of my budget. I like your DST-1200 motor suggestion and I have added it to my list for future builds. But right now, if I were to buy four of them I'd be around the same price as buying two of the Suppo's. So I'm going to stick with the Suppo's on this build. As far as Banggood goes, I don't like to order from places outside the U.S.. I don't like the slow shipping, the times when custom's sometimes slows things down and the possibility that I might be waiting over a month for something that just may never arrive at all. Heck, I don't like the idea of ordering from RTFQ just for the fact that it takes him two weeks to get things out the door. But it looks like he will be getting some of my money on this build. The Afro's are great ESC's...but they aren't a great budget choice. Agreed. I don't like how much the esc's are taking out of my budget. I'm going to bite the bullet connector and order them from RTFQ and wait the 2+ weeks for delivery. That will give me an extra $20 to throw at the FC in the end. There's also the RTFQ "house" motors he says are made by Suppo at just $10.50 each...they're a bit lower KV but higher power than the Suppo's you've already got. And being lower KV they can swing a bit bigger of a prop and have the potential of being a bit more efficient: http://witespyquad.gostorego.com/mot...or-1000kv.html They're also a "shaftless" design which I really like for quads as it seems to minimize damage in crashes considerably. I've added both of these to my future build list but I'm going to stick with buying two more Suppo's for now. I know the motor and I like them. The fact they are good for quads was an unexpected plus! Those are the props I was looking at and they are on back order in the U.S. except for in orange I think. I don't care about the color, just as long as front and back are different of course, but they didn't have any others in stock. So to recap, I'll go with the F-20A Fire Red series SimonK-(RapidESC) from RTFQ and stick with the Suppo's. Other than the flight controller is there anything else I'm missing from my parts list? May need some bullet connectors for the motors/ESC's depending on whether the ones you choose include any or not. And a battery connector for your power harness. I assume you're just going to use the wire you listed to make your own harness? May want to take a look at the quad project on Make from Chad that I posted the link to and how he did the power harness, neat idea using some copper pipe fittings. I'm at work and was quickly looking at RTFQ props and have a couple quick questions. Why bigger props with less pitch? On my watt meter my suppo's look happiest swinging 7x5's and I also have some 7x5R's. And whats the difference between an 8x4.5 and an 8045? Will respond to new replies when I get off work. While on an airplane thrust is as important as the air flow speed. It may not be 2+ weeks. Orders where he doesn't have to customize anything seem to be getting out the door somewhat quicker. I guess we'll find out because at the very least I will be ordering the F-20A esc's from him. They come and go from stock really quick, add them to a wish list and HK will let you know when they're in. And if you're ordering from RTFQ anyway he has a really good price on the 8x4.5 carbon composite HQprops I've heard a LOT of really great things about. I like this idea but they only come in black. I think I'm going to order the props you told me about from the Multirotor Superstore. I've never heard of them. Do you know if they are a good company to do business with? Good call on the bullet connectors. I totally forgot I'm almost out of them. I'm down to one female and three males. Time to reorder! I have a bunch of Deans style 'T' connectors so I'm good on battery connectors and yes, I plan to use the wire I listed to make the harness. I saw Chad's way of doing them from your link and I also saw David's way. David's way is actually an old school trick I am familiar with and I have some extra solid strand wire I can use to do them that way. I have several from OrangeRX for my scratch builds and a couple from Spektrum for my store bought planes. Thank you so much for explaining that to me. I was thinking in that direction but I just didn't understand it. Do the bigger props also help with flight stability? I would think more surface area would mean more stability. Does this also mean that bigger props on lower kv motors like 700 to 900kv motors would be more efficient then a higher, say like, 1400kv motor which would have to swing a smaller prop? Is there a sweet spot for efficiency in regards to kv and prop size? I know there are other variables when dealing with different motors so lets say for these questions they are all the same motors just different kv. I've never ordered from them but a number of people on here have and I've yet to hear anything negative about them. And I've only heard great things about the HQ props. Different colored props help...but to be honest in the air with them spinning...it's really hard for me to tell the colors apart. I've flown on all black just as successfully as I have on mixed colors - though I do prefer the mixed colors just for the chance of easier orientation. What's really helped me was adding LED strips to mine. One color in front and another in back. That's made orientation easier to keep than colored frame arms and props for me. If you have any that support PPM output it's IMHO the best way to go with a multi since you get all your channels on one wire making it much simpler to connect the flight controller. If you have any spektrum sat RX's some of the MW boards and the Naze can use just a spektrum sat for the same simple wiring. I'm glad e_lm chimed in because I'm still very much learning about prop choices. But in general I've learned that larger props on lower KV motors do tend to be more efficient and are what the guys going for super long flight times are running. Some quality time with http://www.ecalc.ch/xcoptercalc.php can help you figure out your best options. Looks good to me...but I'd say on the things I left in above if you can pick up a bit more than you're planning on. Wire always seems to go quicker than expected and even when I order twice what I anticipate needed I end up wishing I had ordered more, thakfully it's cheap so it's easy to order a bit extra. 3.5mm is the size on the bullets. But 10 pair may not be enough depending on how many you have on hand. Each ESC uses 5 (2 for power 3 to connect to the motor) so you'll use 20 pairs total on a quad. But if you have some on hand and/or your motors come with some 1 pack may be enough. Still as cheap as they are they're also one of those things that I always try to buy twice as many as I think I'll need and then have them on hand since they're also light and don't add to the shipping cost. What's really helped me was adding LED strips to mine. That's a good idea! My 350QX had led's in front and back and, now that you mention it, I did tend to rely on them more than I did the props for orientation. Specially when I got a little distance between me and the quad. I don't know anything about using ppm on a receiver so I could be way wrong but I'm guessing my OrangeRX receivers don't have ppm. They are the R610's and were pretty cheap. They also don't have a satellite port on the side. My Spektrum receivers are the AR400 and the AR600. Not sure if they do ppm and neither of those have any extra ports on the case either. I'm glad you brought this up though because I'm guessing this means I need to buy some 150mm servo leads. Like I said, I don't know anything about ppm. In fact I had never even heard of it until you mentioned it. Please let me know if any of my receivers do ppm and I will hold off doing my order with HK until tonight after I hear back from you. Looks good to me...but I'd say on the things I left in above if you can pick up a bit more than you're planning on. Doubled order on all you listed. Each ESC uses 5 (2 for power 3 to connect to the motor) so you'll use 20 pairs total on a quad. Is there a specific reason for this or just personal preference? I always solder my power leads from battery connector straight to the power leads on the esc's. The only reason I put bullets on the output of the esc's is so I can switch motor rotation and swap motors quicker. I do see where putting bullets on both ends would make the esc's more modular. Is this the reason why? I also need to get some zip ties. Can you tell me what size to get and any preference on manufacturer? I bought some cheap ones at Dollar Tree one time when I was restocking on foam board and they broke really easily. Not a bad thing for what I was using them for which was to holding FT power pods on. I understand the reason for using zip ties on the motors; to create a weaker "break" point but I'm pretty sure I want something a little stronger to hold them on. You will see it in the air for sure! I'll do a build log with pictures here plus post the maiden and all other uploaded videos involving it's first flights. Or should I start a new thread for the build and follow up? Here is a link to my youtube channel as well. Nothing really great but I have fun and love the hobby! I'm also going to start looking at Flight controllers now that I know where my budget is at. I get paid Saturday and can throw another $100 or maybe a little more into the pot for a more expensive FC. That'll put my budget around $200 for an FC. I really don't want an FC that I'll have to spend hours learning code and more hours troubleshooting that code. I could do it but I work a lot of hours at a stressful job and don't have a lot of free time. In an effort to not turn into an angry lunatic I try to spend any free time I have relaxing and doing something I enjoy. I haven't fully researched all the popular FC options yet but from what I've read so far I'm starting to lean toward the APM. What do you guys think? Just to recap, what I'll be wanting my FC to do is some nice stable flight and position hold for shooting video. Also RTH. Though RTH isn't as big deal. After the failed RTH of my 350 QX the idea is more of a toy now than something I will rely on. Of course, come to think of it the RTH on my 350 QX may not of failed. The last time I saw it it was kinda headed in the direction of China. I don't have experience with those exact RX's so I can't say for sure...a quick web search showed that the R610 might be capable of being hacked for PPM output...but it doesn't sound like any of them actually include it. So yeah, some servo leads would be a good plan! Just personal preference. I thought about just soldering mine all together but decided it would be nicer to have connectors so I could swap things around and experiment easier. I made my power harness by soldering 4 female connectors together on each side and attaching them to the battery leads, then I just plug my ESC's into that. But there's nothing wrong with soldering it all together if that's what you prefer. I've just been using the cheap zip ties from harbor freight. They seem to be strong enough but not too strong. I use the smallest black ones they carry for mounting my motors, the next size up for mounting ESC's (because the smaller ones are too short). I also use the really small ones with ID tags on them to mount my FC by cutting the "heads" off and just pushing them on the other side so the tab retains one side and the head retains the other with no loop. I belive Cyberdactyl has posted photos of this method and I've posted some in my build thread as well. On your guys advise I'll go with the KK for my first flight controller. It seems to be well liked everywhere I've looked. I have read the differences e_lm_70 posted and what you said about the different hardware used between KK2.0 and KK2.1. My thinking is that if this is going to be a segue FC for me I would feel more comfortable spending the twenty bucks on the KK2.0 at RTFQ. All I plan to do with it is learn my quad and the basic settings of a flight controller. I'm not expecting anything special out of it. Given these expectations do you think I'll be okay with the KK2.0 or should I step up and spend the extra money for a KK2.1? Also, the cheapest price I have seen for the KK2.1 is around $50. If you know of some place I can get it (Inside the US) cheaper I would start leaning toward the KK2.1. Thanks again to everyone who has taken the time to post to this thread and for all the great advice! Yes, for 20$ KK2.0 is ok. Here is what you can still get from a KK2.0 with an external GPS and some extra sensors. Thanks for the advice! The board has been ordered. I just finished up placing my last order for everything for my quad, I hope. I'm going to make a list below so you guys can tell me if I forgot anything. The total for everything listed with shipping included was $140.45. I ordered the KK2.0 from RTFQ without pins installed. I'm hoping this will speed up shipping. I'll let you know when the order from RTFQ ships. Wise man. You were thinking "I don't want to sit here waiting on props when I could be flying in a few weeks"
They really do go quick when you've got 4 on an airframe and are both learning how to fly a quad, getting a new airframe tuned in and learning that new airframe at the same time! Don't worry though, it's better to have too many than not enough and you'll go through them slower and slower as you get better and you and your multi get more in tune with each other! With SimonK ESC, stock PID of KK2.0 should work without any setup needed ... so ... it should be easy. That must of been what I was thinking! Or I just plain wasn't thinking. I do that a lot too. I like the idea of little to no setup. I'm pretty sure auto-level mode will will always be on. I'm not wanting this quad to get crazy. I just want it to fly around and shoot video. I was reading over the manual for the KK2.0 board and I absolutely love step one for programming the esc's! "1: Important: TAKE OFF THE PROPELLERS OR DISCONNECT ONE WIRE FROM THE MOTOR!!" If your wondering why I'm making a point of this check out what I did in my thread here! I'll keep you guys updated on shipping from RTFQ and on when everything else comes in. I'm going to get started on my frame soon but I'll wait until I get everything in before I start a new thread with a build log. Thanks again to everyone who commented on this thread and for all the great opinions and advice! Small update. Everything shipped today EXCEPT my order from RTFQ. And according to USPS tracking my order from Multirotor Superstore will be here Friday! And I didn't pay for anything above standard shipping. I placed an Amazon order on the same day with free two day Prime shipping and it will be here the same day. Thats some awesome shipping from MRSS! I'll be ordering from them again just on their shipping alone! Altitude Hobbies also got things out the door in a hurry. My previous two orders with them took about a week for them to ship and this time they did it in a day, so gold star for them also! 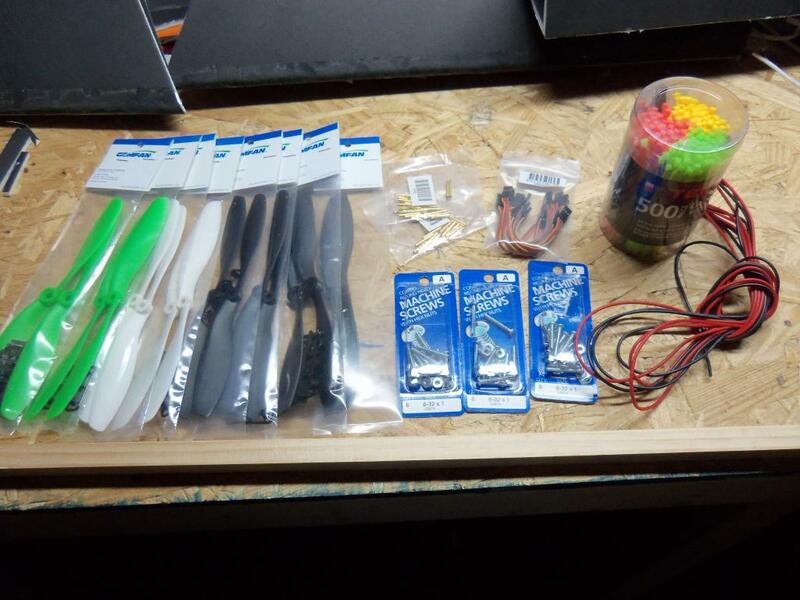 My order from Hobby King, Multirotor Superstore and Amazon arrived today! I should be getting the motors from Altitude Hobby's on Monday according to the USPS tracker and still nothing from Ready to Fly Quads. My order still shows "processing". Also, I finally got a chance to stop by the hardware store today and pick up some square dowel and screws so I should be able to start making cuts on my next day off! I'll start a build log in a new thread then. One last update on this thread. RTFQ shipped my stuff today! I placed my order on May 13th so that's 10 days to get my stuff out the door. And I ordered my FC with the straight pins uninstalled. No soldering was done in house. I'm not complaining. I know Paul is a busy man. Just wanted to give you guys a heads up. So expect 10 days for stuff to get out the door. I'm assuming orders will take longer if you need things soldered. So if you order from RTFQ expect good prices but be prepared to wait. I already cut my booms for my quad and have started sorting out assembly. I think I'm going to vary my build slightly from the FT knuckle I'm basing it off of. My next post will be in a new thread where I start building my quad and I already have questions so be ready guys! I killed my crappy made H frame....my frame flexed which caused a perpetual right yaw....but the DIY frame you mention awesome! thanks man, imma build that, it looks awesome....imma use aluminum arms for a little more strength. The diy gimbal is cool too. thanks for the post man!